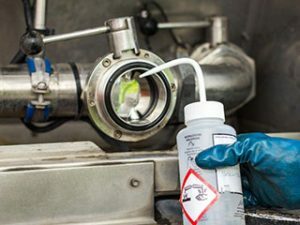 In order to safeguard water quality and public health, it is required that private supply pipes are chlorinated and tested before a connection is allowed to the water main. Pipework chlorination is essential to ensure suitability and safety for the provision of drinking water. Each chlorination commences with flushing of the system with clean drinking water in order to remove any debris and providing a clean base for the chlorination to take place. Following the initial flush through, the system is filled to capacity with a chlorinated solution (minimum 50mg/l strength) which will remain for a minimum of 1 hour. After this contact period has been achieved, Water Direct technicians will neutralise the chlorinated solution and dispose of it safely, flushing the system through again with clean water to remove any residual traces of chlorine. The system is then again filled to capacity with clean drinking water, sitting once more for a minimum contact period of 1 hour. This final flushing water will then be sampled for chemical and microbiological analysis and the samples submitted to one of our laboratory partners to be analysed using UKAS approved methods. Following receipt of the analysis from the laboratories, Water Direct provides a certificate of chlorination, along with a full analytical report for each sample. These results and certificates are usually provided within 7 days of the work taking place providing assurance that the system is safe for use in the supply of wholesome drinking water. This evidence can be provided to the incumbent water utility to enable a connection. When is a Chlorination Needed? Requirements for chlorination and specific tests needed can vary depending on your utility company. You should always check with your utility what is required and the level of certification expected before the chlorination goes ahead.